Smart thermostats are the future of homes in the United States, and for some pretty significant reasons we’ll get into below. Why bring this up now? Because starting in April 2019, we’re offering up to $1,700 in savings in a Lennox iComfort wifi smart thermostat systems. With that in mind, we thought we’d outline exactly why smart thermostats are the future and how they can improve your life. Before we outline some of the features smart thermostats have, we want to be clear: not all smart thermostats have all these features. Features can different depending on the manufacturer and model, so if a particular feature catches your eye, be sure to mention it to us so we can ensure you get the model that is right for your needs. Among the most common features of most smart thermostat systems is the ability to control the thermostat from anywhere you have cell service. On vacation in Hawaii and see that you’re getting a bad cold snap back home? A tap on your phone and you can adjust the temperature so your pipes don’t freeze. Away for the weekend in the middle of summer and worried a sudden heat wave will bother your cats? You can adjust the A/C no matter where you are. This is a powerful tool that offers great peace of mind. Thermostats that allow you to schedule heat and cooling cycles are not new. These days, most people in our area have thermostats that allow you to automatically turn down the heat or A/C while you are at work, and have the temperature automatically adjust when you get home. What these new app-based scheduling features allow you to do is to not only do this remotely, but to create highly in-depth temperature management schedules that allow you to customize with great detail. Hourly, daily, weekly, weekends, holidays – whatever your needs, these apps can handle it. Some smart thermostat systems come equipped with motion detectors that can sense when you are in a room. This data lets the systems determine what rooms are getting used most often and when, allowing them to better schedule heating and cooling cycles so you get maximum impact for your dollar. This can be a huge boost for your energy efficiency. In conjunction with the motion detectors mentioned above, some smart thermostat systems can adjust their own schedules based on the way your home is being used. That means even if you set it and forget it, the system itself will “learn” and adjust itself as needed. A great feature of newer smart thermostats is that they can provide detailed statistics regarding your energy use. This allows you to get a better idea of where and when you are using more energy than you realize, and adjust your lifestyle accordingly. Is that “always on” video game system you have sucking up more power than you knew? With a smart thermostat, you’ll know to unplug it between uses. This is the obvious one, which is why we saved it for last. When you invest in a smart thermostat system, it’s a true investment. You’re saving money every month on your energy bills, and that adds up over the long term. Are you interested in knowing more? Contact us at 732-244-2880 and ask about what the smart thermostats we carry can do for you. Spring is here and summer is right around the corner. That means you will soon fire up your air conditioner in the hopes of having cool, comfortable days even in the midst of a Jersey Shore heat wave. In most cases, that will go smoothly and your A/C will fire up without a hitch. But as we all know, life has a tendency to throw us curveballs. In order to better your chances of avoiding expensive repairs or replacement, here are some simple ways we can prep your A/C for summer (and a few ways you can help) to ensure you enjoy life at the Jersey Shore even when it’s sweltering hot outside. Remove Any Debris – This is one you can (and should) do yourself. Check the area around your air conditioning unit and remove any debris from it (fallen leaves, etc. ), especially if they are blocking any portion of the unit. Left unchecked, these seemingly small issues can turn into big problems, especially if debris gathers near your condenser coils. Change Your Air Filters – This is also one you should be handling. Every three months or so, change the air filters in your home. Pollen, dust, and other contaminants can accumulate, causing your A/C to run less efficiently (therefore costing you money) and spreading that dust and pollen throughout your home (which has potential health negatives). Clean Your Condenser Coils – During a spring check up or maintenance call, cleaning your coils is an important part of ensuring the unit will function efficiently through the summer. Lubricate Any Moving Parts – Much like any piece of machinery, your air conditioning unit has moving parts that need to be lubricated to protect them from wear and tear. Let this go undone for too long and you run the risk of shortening the lifespan of your unit. Clear The Drain Line – Draining the line is a simple but essential way of ensuring your A/C remains in good running order. Check Your Coolant Lines – It goes without saying that if your coolant lines aren’t in good working order, your air conditioner won’t be, either. We’ll ensure they are free of leaks, worn lines are replaced, and existing lines have adequate insulation. Ensuring these basic steps are done is simple and affordable, and will be an essential part of being sure your unit operates efficiently for as long as possible. Nothing lasts forever, of course. According to the U.S. Department of Energy, a central air unit that is 10 years old could operate with 20 to 40 percent less efficiency than a newer model – and that’s a lack of efficiency you will feel in your energy bills. Some of this can be mitigated by making your home more energy efficient. Modern insulation, new windows and doors, and other upgrades can help offset some of those increases. But the truth is that you will eventually need to replace your A/C unit. When that time comes, reach out to Toms River Heating and Cooling. We are a family owned and operated HVAC service who have been serving the Ocean and Monmouth county area since 1970. Reach us at 732-244-2880 or visit our contact page to send us an email. Having served the Ocean and Monmouth county region since 1970, we’ve been in countless offices and workplaces helping keep the heat or air conditioning in running order. Keeping you comfortable is what we do best. That also means we’ve seen the inevitable debates that arise when employees just can’t get on the same page when it comes to the most comfortable temperature for the workplace, or even worse, the miserable days that occur when the boss is so cheap he keeps it far too cold in the winter and far too hot in the summer. It’s best that you get permission before taking this approach, since space heaters can be energy hogs, and from a safety standpoint they are not suitable for certain environments. If you get the okay from your manager, however, these can be a lifesaver. Look for smaller, personal space heaters. They are affordable and can fit snugly under a desk, just be wary of fire hazards! They are also ideal stopgap measures during times when there is furnace repair or furnace maintenance being done in the office. Technology is amazing. We’ve been in the heating and cooling business for going on 50 years now, and we never cease to be impressed by the advances made in our industry. In this case, however, it’s a combination of the tech and clothing industries that are making the advancement. These days, you can find affordable gloves, vests, and other garments that are warmed with just a little bit of power. You plug a small USB battery into them, small enough to slip into a pocket, and the whole garment warms up, keep you nice and toasty even on cold days. These are a great way to keep warm at a cold workplace. It’s like having a furnace in your pocket! An old standby at this point, the often overlooked heating pad gets the job done and even has the advantage of turning itself off after a while if you forget to do it yourself. They are not as cozy as USB clothing – it can be awkward sitting on one or having it draped over your shoulders – but a little warmth is better than a chilly office. This one is so obvious we hesitated to list it, but it has to be included. When push comes to shove, often the simplest way to address a cold office is to put on some more clothes. Keep a hoodie or sweater or shawl at your desk, and wear it when needed. It’s a simple method, yes, but it’s the old standby because it works. Even in a cold office, this can keep you going. This is where we come in. Sometimes those cold spots in your office are not a result of a stingy boss or people manipulating the thermostat. Sometimes there is an issue with the workplace’s heating system or ductwork. Often, these issues are relatively easy and affordable to address. Someone just needs to take the first step and make a call! No one enjoys working in a cold office, especially when you’re used to the warmth of the Jersey Shore region, but try a few of the ideas above and you may find some relief. Either that, or talk to the boss about turning up the thermostat! We live and work in an interesting area. That’s not news to anyone who lives here, of course. There’s a reason why the shore population explodes during the summer months. The Toms River region, and the Jersey Shore as a whole, is a fantastic place to be. That’s why we set our business roots down here all the way back in 1970. Over the years, we’ve come to love the history of our community just as much as we love the people, places, sights, and sounds of it. With that in mind, this month we’ve gathered a dozen quirky and cool facts from throughout the history of Toms River and Ocean County, some old, and some recent. We think you’ll find them interesting. We sure did! The true “Tom” of “Toms River” is unclear, but it’s widely believed to have been named after Thomas Luker, a ferryman who used to run a ferry that crossed the Toms River, which at the time was called Goose Creek. English Captain William Tom and a Native American man called Tom have both been possible origins of the name, too. A long, long time ago, Toms River was part of Shrewsbury Township. So long ago, in fact, it pre-dates the United States. Way back in 1767, before the U.S. was the U.S., a royal charter was acquired allowing a portion of Shrewsbury to secede and become Dover Township. The town continued to be known as Dover until 2006. Up until then, “Toms River” was an unofficial name sometimes used to describe the downtown area. A lot of surrounding towns would look a lot different if it wasn’t for Toms River, because portions of the town have been snipped off and became part of other communities. Towns like Jackson, Manchester, Barnegat, Berkeley and others were all created in part by tracts of land that used to be part of Toms River. The same holds true for Ocean County as a whole. The county used to be part of Monmouth County. It was finally split off into its own county in 1850. A little bit of Burlington County was also snipped off to form Ocean County, specifically Little Egg Harbor. When Ocean County separated from Monmouth County, a vote was held to decide what the county seat would be. The village of Toms River won, but another village was close in the running and almost won: Lakehurst. Imagine how different Ocean County would be if Lakehurst was the county seat! The Village of Toms River tried to secede from Dover Township two times in the early 1900s. Both efforts failed. The largest town in Ocean County is by far Jackson, which is just over 100 square miles in size. Six Flags Great Adventure is probably bigger than you realize. As of 2012, after the amusement park was officially combined with the safari, it became the second largest theme park in the world, second only to Disney’s Animal Kingdom. The Garden State Parkway is now an essential part of life here, but the Parkway wasn’t always around. It didn’t connect the shore with North Jersey until the 1950s. Prior to that, people often had to make that the long trek on Route 9. We could go on, but perhaps we’ll save some more tidbits for a future article. In the meantime, we hope you enjoyed. If you know some cool trivia and facts about our area, tell us about them in the Facebook comments! As a homeowner and a consumer, it’s easy to be skeptical when a heating and air conditioning company suggests you get an annual furnace inspection. It probably sounds like a sales pitch to you, and since you’ve never had annual maintenance done on your furnace before and everything has been fine, it’s got to be some kind of sales scam, right? The truth is, annual furnace inspections really are an important part of home maintenance. Annual inspections can be referred to a number of ways, but the terms are largely interchangeable. Annual maintenance, a checkup, a “tune up,” and others. All mean basically the same thing: a thorough review of your furnace and related systems by a qualified professional, checking for leaks, blockages, rust, corrosion, wear and tear on parts, and overall safety. Sometimes this might include a cleaning, too, if necessary. No, you’re not going to discover some expensive problem with it every year – and that’s the point. The idea is to prevent problems before they happen, extending the lifespan of your furnace and addressing issues before they become expensive fixes. In fact, more than half of no-heat service calls made during the winter could have been avoided had the furnace been serviced in the autumn. Depending on the age of your furnace, there is some flexibility in how often you get yours serviced. If you have a new furnace, it’s safe to have inspections every other year. When your furnace is over a decade old, however, an annual inspection is recommended. A further benefit of annual maintenance is that it can help your heating system operate more efficiently, which means spending less money on your energy bills. Even routine maintenance you can do yourself can make a big difference. According to Energy Star, a branch of the U.S. Environmental Protection Agency (EPA), simply changing your air filters every three months can result in a reduction in your energy bills. A programmable thermostat can help, too. Want to more about what is entailed with annual furnace maintenance? Contact us at (732) 244-2880 and we’ll be happy to answer any questions you have. When Sergeant George “Tyler” McGibbon of Toms River, NJ returned home in 2017, the wounded warrior was welcomed with open arms. To help him transition back to civilian life, a squad of friends, family, contractors, decorators and veterans support groups went into action – including the team at Mitsubishi Electric, ABCO, and Toms River Heating & Air – to customize a home living space for him. Renowned actor Gary Sinise set the project in motion with his RISE program which provides injured veterans with specially customized smart home makeovers. They teamed with George To The Rescue, the hit NBC TV show that undertakes home makeovers for people in need. Soon after, the garage in the McGibbon family home had been transformed into a new living space with full bed, bath and living room customized for Sgt. McGibbon. Stylish, roomy and functional, it’s an all-new place to call home as he continues therapy and readjusts to daily life. Maximizing limited home space. Jason Wong of ABCO’s Lakewood, NJ branch spoke to the versatility of Mitsubishi Electric’s ductless equipment. “It lets us tailor HVAC systems to meet specific needs of individual customers. That’s what we did for Sgt. McGibbon.” The job called for a heating and cooling solution that didn’t take up a lot of space and provided year round comfort, durability and energy efficiency. The indoor Mitsubishi MLZ one-way ceiling cassette heat pump was installed in the bedroom and living areas. The units are compact and fit snugly between standard ceiling joists and are ideal for retrofit and new construction. Stylish cozy all year, the way it should be. For even more convenience, the units are sync’ed up with the kumo cloud wifi system. 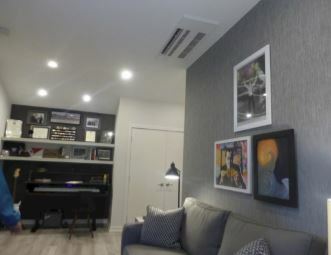 “Our ductless system was a logical choice for this project in which a small space was skillfully turned into a new fully-outfitted, roomy and comfortable apartment for Sgt. McGibbon,” said Tim Rabel of Mitsubishi Electric. Catch the whole story . Now you can meet the family, the friends, the fire fighters and town officials who pitched in to make the project a success. Because George to the rescue chronicled it from beginning to end and will broadcast it on NBC TV on October 27, 2018. Tune in and learn all the details of this story of courage, coming home and inspiration.